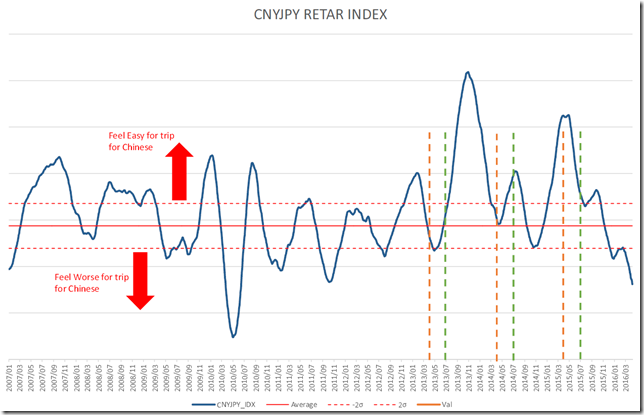 CNY/JPY long term; Chinese feel a terribly price rise in Japan. She get monthly allowance from her family and she watches the rate of CHYJPY. 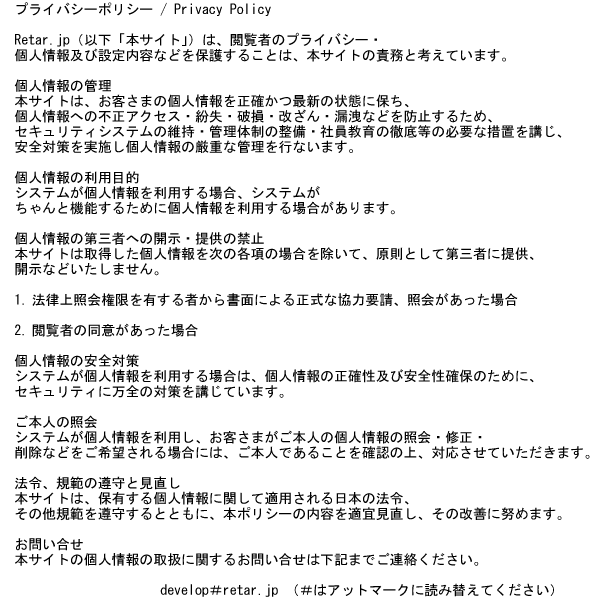 And now, we build up the feeling model of CHYJPY. 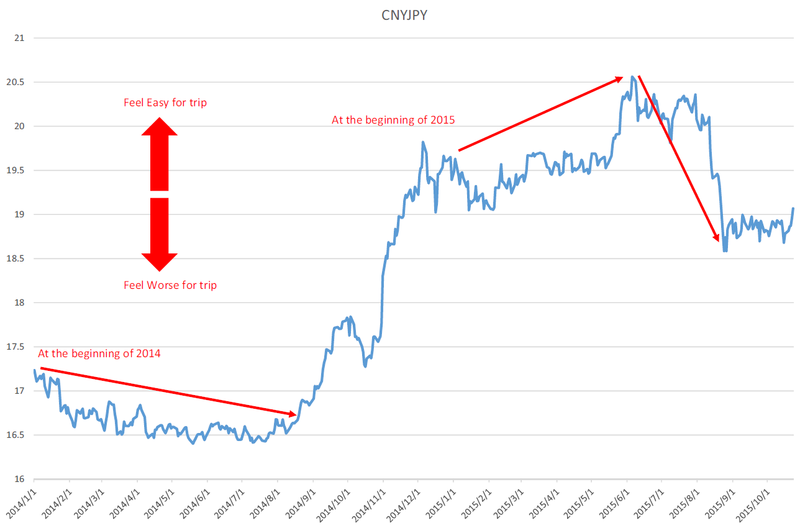 This is the CNYJPY chart after 2013. This market has seasonality cycle and from April to summer, Renminbi became strong. Using Japan National Tourism Organization table, we can know visitors increased in summer. We can conclude Renminbi was stronger in summer and this may be one of the reason of increasing. From now, Renminbi may be stronger from seasonally cycle. But Renminbi is weaken and Chinese must feel bad for shopping. 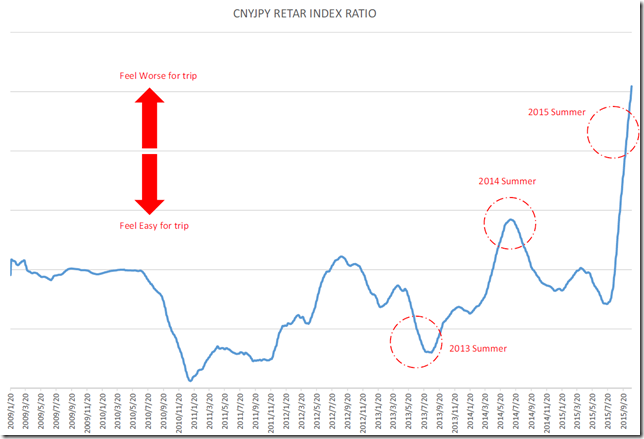 And we develop “the gaining experience index of CNYJPY”. 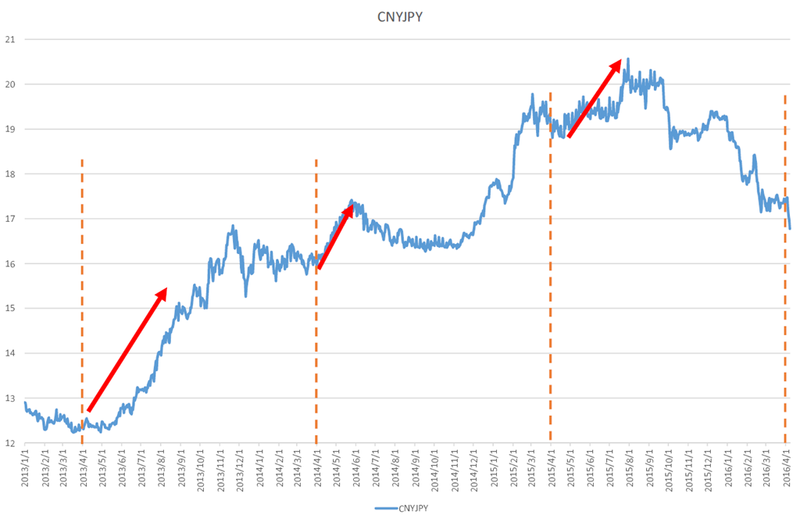 From dotted line to dotted line, this is neutral in CNYJPY rate. 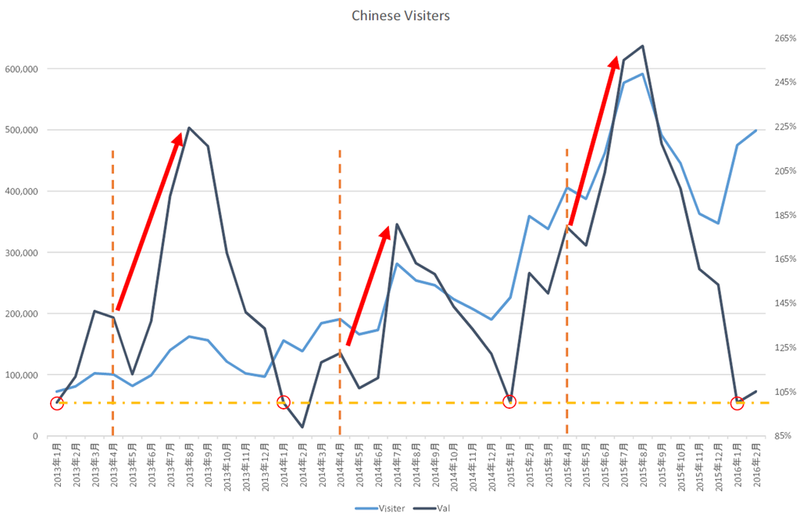 Upside of dotted line is feel easy for Chinese and down side is feel worse of Chinese. 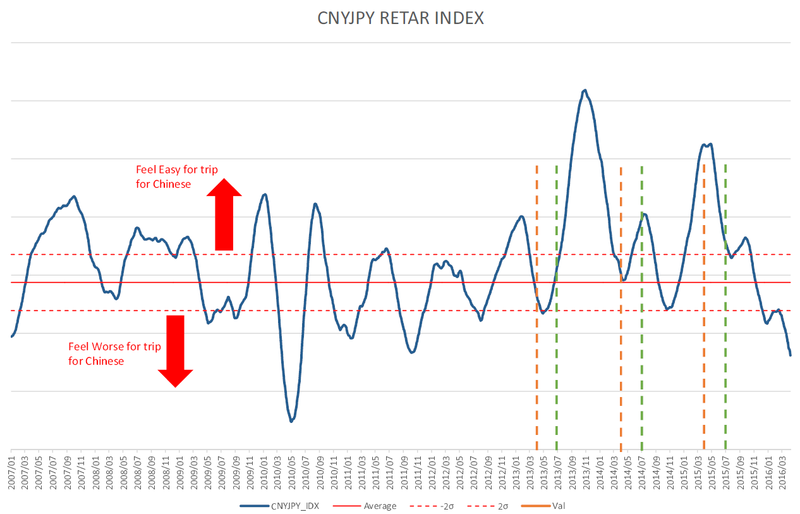 In this year, the CNYJPY rate became worse and worse for Chinese and we can know the painful position for Chinese student. 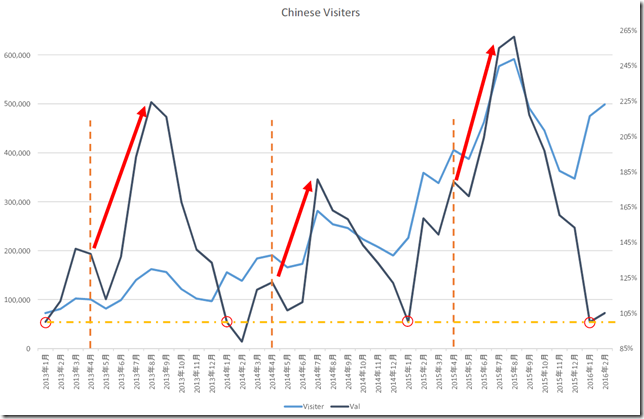 And Chinese inbound visitors must feel “Prices have soared in Japan”. 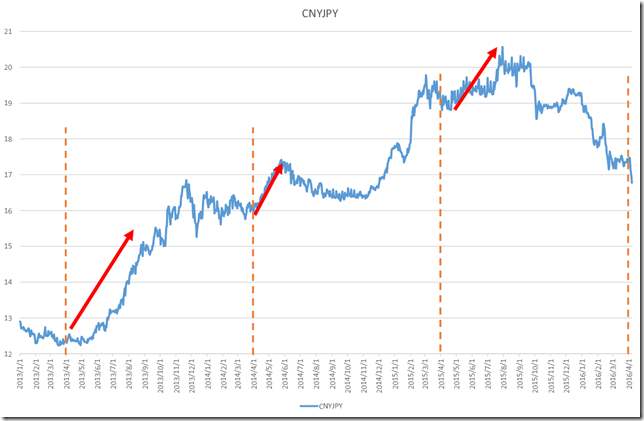 CNY/JPY long term; Chinese might feel Japanese trip have some difficulty. Japanese yen was weaken form the beginning of 2014 to 2014 summer but this year, the price went up and down. The range of drop from beginning of the year to summer was very similar. 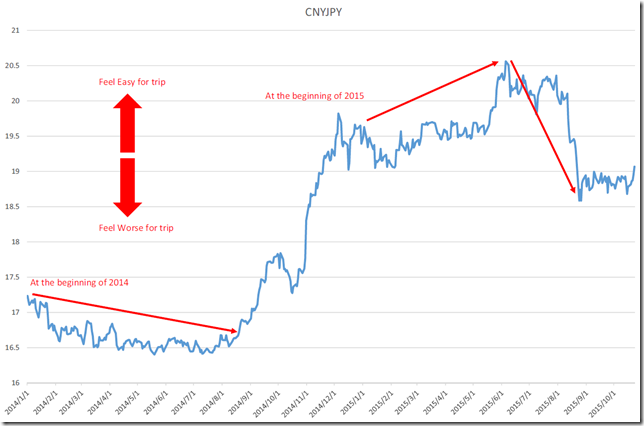 Chinese might feel Japanese yen became weaken and “We want to trip Japan”. But they feel “Chinese Yuan is weaken” in their mind. Our “Retar INDEX RAITO” suggests this fact. In 2013 summer, Chinese wanted to feel to trip Japan. And they might make a trip schedule, “Let’s trip Japan in next summer”. But in 2014 summer, they might feel “Japanese yen seems to be strong”. And Japanese yen was much weaker than last year and they fell happy. 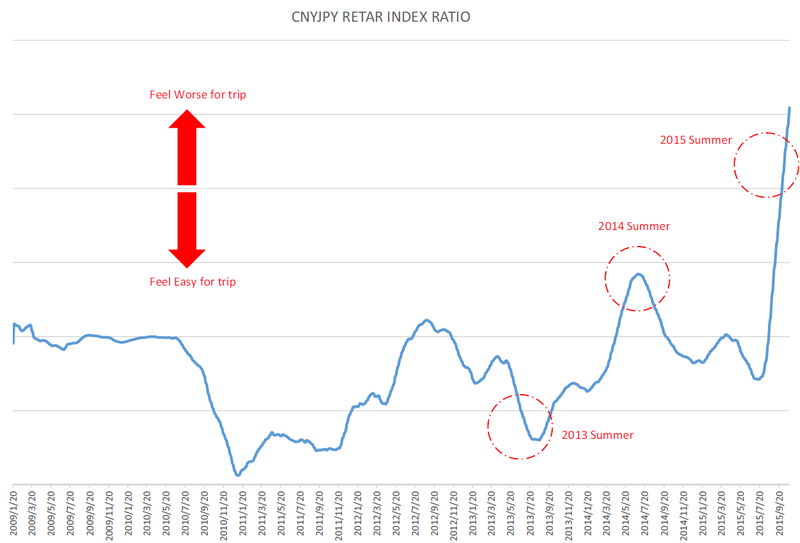 In 2015 summer, they felt “Japanese yen was weaken but not so much happy”.